Adrian Spalding (6 Jul 1960), Patrick Moore (c. 1960), Stella Szachnowski (1962 or 3), John Mills (c. 1990) & Wade Roush (15 Jul 2000). 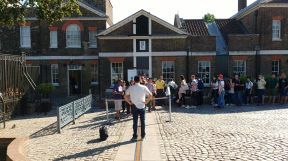 Although the Meridian Line in the Observatory courtyard is now visited by over a million visitors a year, it seems incredible to think that before 1960, its position here was unmarked. Such is the power of marketing! Despite the fact that the Line is one of its most important assets, the Observatory has no unified records that show how it has developed over the years. The résumé that follows has been gleaned from a variety of sources and should be regarded as work in progress rather than definitive. 1851: First observation with Airy Transit Circle (ATC) and establishment of a new Greenwich Meridian – the Airy Meridian. Removable section (now fixed) of boundary railings at north end of line almost certainly dates from this time. 1884: Adoption in principle of Airy Meridian as Prime Meridian of world. 1949: Proposal for the Royal Observatory buildings to be transferred to the National Maritime Museum as an annexe to deal with the subjects of navigation and astronomy. 1953: Opening of Octagon Room in Flamsteed House to the public. Proposed sign (on building?) above the Meridian was to carry the words: GREENWICH MERIDIAN LINE | East Longitude | West Longitude. 1960: Opening of whole of Flamsteed House to the public for the first time. First marking of Meridian in courtyard – a brass strip in a stone slip across a gravelled courtyard. Accompanying press release stated: ‘The Meridian is marked across the courtyard so that visitors can indulge in the conceit of being photographed standing with a foot in each hemisphere.’ At this time, the strip ran only from the boundary railings at the north end to the edge of the pathway adjacent to building (not across the pathway itself). Black sign erected on north facing shutter stating: LINE OF MERIDIAN | EAST LONGITUDE | WEST LONGITUDE. Small double sided sign at northern end of line with the wording: ‘This stone slip is laid along the Greenwich Meridian Line. This passes through the centre of the transit instrument of the Royal Observatory | By international agreement in 1884 it has been universally adopted as the Meridian of Zero longitude from which the longitude of every other place is measured.’ Without further evidence, it is impossible at present to know if in these two signs were not in fact already there and were installed as early as 1953, when the Octagon Room first opened to the public. 1967: Courtyard resurfaced with Granite setts. Line extended across path adjacent Meridian Building. Opening of Meridian Building for the first time to the public. ATC shutters painted blue. New sign with altered wording on vertical shutter probably dates from this time (it was certainly in place by 1968) and carried the words: PRIME MERIDIAN OF THE WORLD | EAST LONGITUDE | WEST LONGITUDE | Centre of transit circle | Latitude 51º28’38”.2 north | Longitude 0º00’00”. There also appears to have been another sign with similar or identical wording beneath the shutter that was only revealed when the shutter was open. The sign(s) appears to have been replaced from time to time (dates not yet ascertained) with the latitude given (on at least some) as 51º28’38” rather than 51º28’38”.2 and with a very slightly different layout of the wording. c.1990: Time zone map erected across line adjacent to railings (a second was erected on the opposite (S) side of the building). Sign on railings remounted higher up. New sign on vertical shutter of ATC, with changed wording: Longitude Zero | The Prime Meridian | of the World | Greenwich | Latitude 51º28’38” | Longitude 0º0’0” | East Longitude | West Longitude. 1992–93: Major remodelling of Line. Removal of time-zone map. Shutters painted black, with red vertical line depicting Meridian. New stainless steel sign on vertical shutter of ATC carrying the words: PRIME MERIDIAN OF THE WORLD | CENTRE OF TRANSIT CIRCLE | LATITUDE 51º28’38” NORTH | LONGITUDE 0º00’00” | EAST LONGITUDE | WEST LONGITUDE. Line from edge of pathway re-laid with pairs of terrazzo paving slabs set either side of the line. Five pairs inset with brass script depicting latitudes of different locations around the world. Concrete pillar with a viewing telescope aligned along the Meridian at northern end. Meridian Line itself broadened and Illuminated from below with green (LEDs?) under glass, edged with stainless steel. Installation by Artists Peter Fink and Anne Bean of laser pointing north along the Meridian (fired from above the ATC and passing though a small opening at the top of the vertical shutter). Free standing sign on west side of Meridian Line and certificate machine on east – the later moved into a different housing further to the north by 1996, and the sign to eastern side in flowerbed in 1996 or 97). 1997: Sign on ATC shutters raised and replaced by Accurist Countdown Clock, counting down from 1000 days to the start of the year 2000 after which it counted upwards until removed in 2011. 1999: Sponsorship of the Line by The Times – Replacement of viewing telescope with stainless steel sculpture (sculpted according to PMSA by Christina Garzia and unveiled in June 1999 (Link below)); new red LED display along line showing scrolling headlines from The Times (live feed); & two stainless steel plaques carrying (The Times logo and the Words: THE TIMES SPONSORS OF THE GREENWICH MERIDIAN) set amongst the granite setts on either side. Sculpture and live feed managed by THINKFARM (link below). The concept of the installations did not go down well with Pandora who wrote about the proposals in The Independent on 26 February (link below). Headline display suffered frequent failures. Line covered with red tape during some periods of protracted down time. New higher-powered laser (Millennia Vs) sponsored by Horizon Laser Graphics and Spectra Physics installed with added fibre optic. Switched on in December. Visible under the right atmospheric conditions from over 35 miles away with the naked eye and 60 miles with binoculars. 2000: Erection of wall between granite setts of courtyard and path adjacent building to help reduce tripping hazard (surfaces at different levels). 2003: Replacement of scrolling headlines with single row of red LEDs – which subsequently also failed. Removal of The Times sponsorship plaques. 2006, Nov: Red vertical line on shutters depicting Meridian removed during redecoration. 2009, March 19: Insertion of polished bronze strip over glass slips covering LEDs. (Bronze fully aged within a week). 2011, July 27: Unveiling of OMEGA's London 2012 Countdown Clock (counting down to the start of the Olympics and replacing the Accurist Countdown Clock). 2012, mid- Sepember: Removal of the OMEGA Countdown Clock and its replacement with a red vertical line on the ATC shutters. 2014, May: Removal of red vertical line on shutters and replacement of the sign by a simpler one carrying the words: PRIME MERIDIAN OF THE WORLD | EAST | WEST. Erection of a removable metal fence in the courtyard between the line and the gates into the Park in an attempt to prevent it from being seen by non-paying visitors. 2015: Removal of stainless steel sculpture at northern end of Line.